The Moto Guzzi Museum is located in Mandello del Lario at Lake Como in the factory where the Moto Guzzi marque was born in 1921. 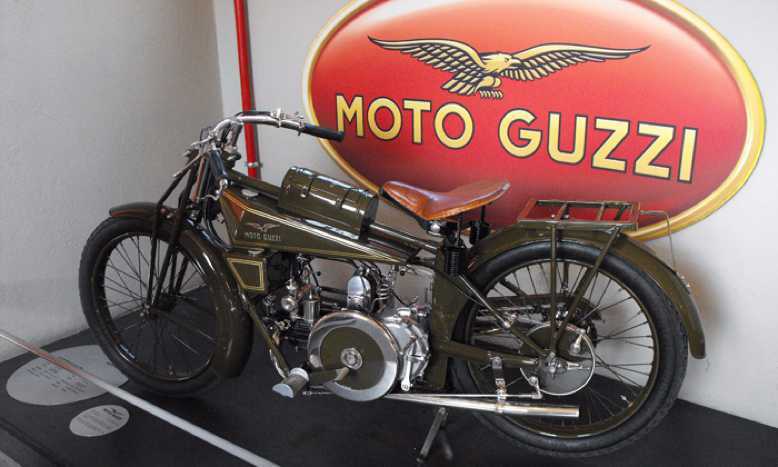 Moto Guzzi was conceived by two aircraft pilots and their mechanic serving in the Air Corp during World WarI: Carlo Guzzi, Giovanni Ravelli, Giorgio Parodi. Assigned to the same Miraglia Squadron, the three became close, despite coming from different socio-economic backgrounds. So the trio envisioned creating a motorcycle company after the war. Guzzi would engineer the motor bikes, Parodi (the son of wealthy Genovese ship-owners) would finance the venture, and Ravelli (famous pilot and motorcycle racer) would promote the bikes with his racing prowess. 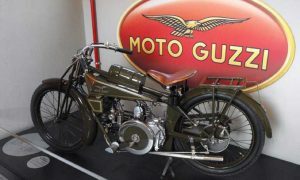 Guzzi and Parodi (along with Parodi’s brother) formed Moto Guzzi in 1921. Ravelli died just days after the war’s end in an aircraft crash and is commemorated by the eagle’s wings that form the logo. The exhibition area consists of a collection of over 80 vehicles and offers an insight into the social and economic development of the country. For example the Norge 1928, the first dedicated touring machine in the history of the motorcycle designed by Carlo Guzzi and his brother. Moreover the Guzzi Sport and GT series of the thirties, the Airone, the most popular middleweight motorcycle in Italy from 1939 to 1957 or the Falcone model, a dream for many of the riders of the fifties. Furthermore the ‘Guzzino’ and ‘Galletto’, very popular in the postwar period. Besides production bikes, the exhibition displays a dedication to motorcycle racing. For example the Guzzi 4V of 1924 with which Guido Mentasti won the first European title at Monza, the twin500 of 1946 of Omobono Tenni. Further the Guzzi 350 “World Champion” in 1955, and more recently the V7 series which set 19 speed records in June and October 1969 at the Monza circuit.